Britain's Laura Robson said she no longer felt pain in her wrist, after losing on her return to the WTA Tour. Robson, who last played at the US Open in August, was beaten 7-6 (7-3) 6-2 by Magdalena Rybarikova in the first round of the BNP Paribas Open in the USA. The 22-year-old, who has struggled with a wrist injury for the past 18 months, plans to play a full clay-court season. "I'm 100% better. The last time I felt pain was in January," said Robson. "The doctor told me to 'Run Forrest'." Robson, who was quoting the 1994 Oscar-winning film Forrest Gump, was ranked as high as 27th in the world in July 2013, but she has dropped to 551 after two injury-hit seasons. She intends to use the protected ranking - given to her for being injured - during the clay-court season. Robson added: "It will always be in the back of my mind - any pain I feel in my arm and I am in panic mode. So to get the all-clear not just from the surgeon, but from other doctors I have seen is nice." 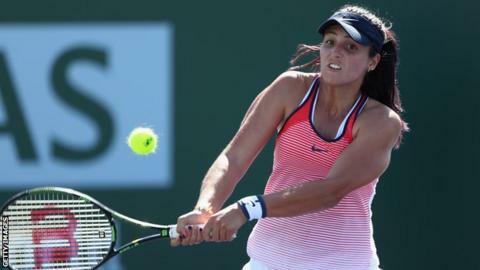 The Briton held her own in the first set in Indian Wells, with both players breaking three times, but the Russian world number 97 won in 90 minutes. Robson has not won a WTA main-draw match since September 2013.